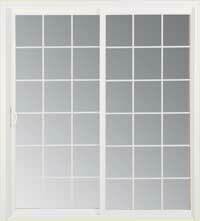 If you are in need of a vinyl patio door or two, you came to the right place. Insight Glass has been in the Window and Door business since 1987 - Supplying and installing thousands of vinyl patio doors. Here are a few of our favorites. For new construction projects, the Studio Series offers a high quality budget conscience package. The Studio Series has all the essential features and options builders require but with the same quality engineering design and performance of the Artisan Series. The Studio features a maximum glass area with a narrower frame to provide the greatest area of viewing. The beveled frame adds beauty to your home with classic lines and blends seamlessly with any of Amsco's vinyl product lines. A lifetime warranty for as long as you own your home. The Pinnacle of Performance and Appearance. These attractive sliding patio doors in the Artisan Series offer easy upkeep and superior energy efficiency. Choose from two different styles in a variety of sizes and configurations to meet any design criteria. The Contemporary style offers a maximum viewing area with durable, sleek lines. 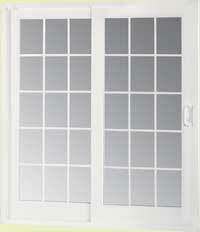 Or, choose the French style sliding patio door for a more elegant look. These doors have a lifetime warranty for as long as you own your home. The Project Managers at Insight Glass are experts in vinyl patio doors and will be more than happy to answer any questions and assist you on your project. 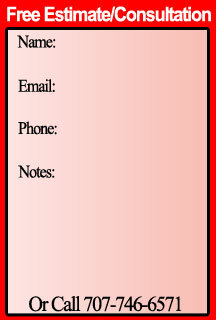 Give us a call at (707) 746-6571 or take a minute to send us an email. We would love to hear from you.